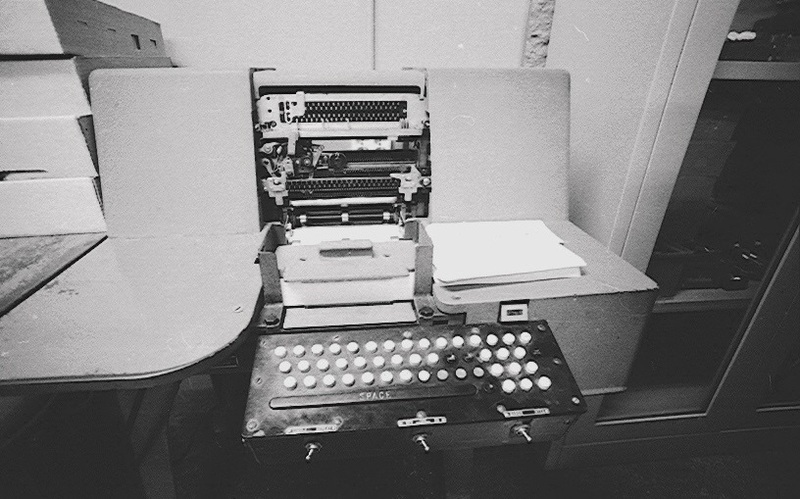 The USSC90, punch-cards and codes. 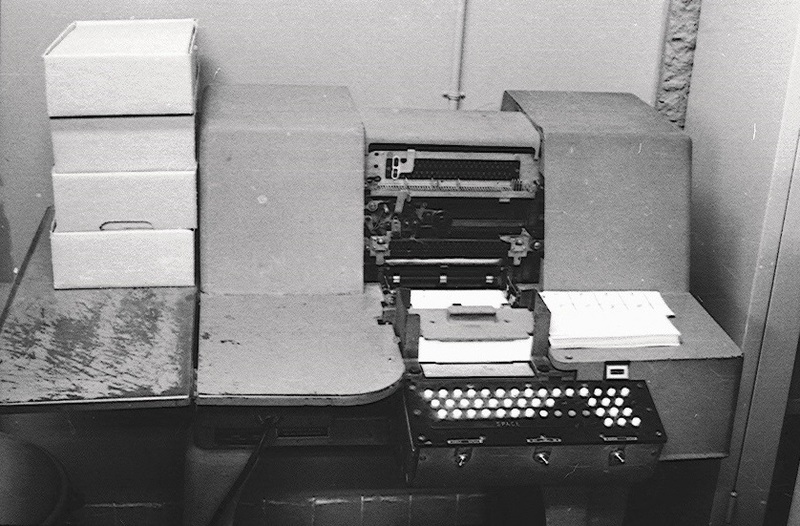 A 90 column punch-card contained two rows of data, an upper half and a lower half with each 45 columns of 6 bits. 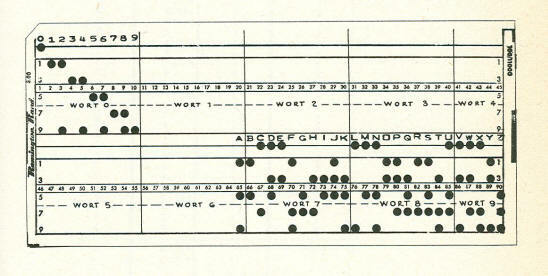 In the punchcard, each high-bit (1) was represented by a round hole. when they got moist they would get soft and swelled and could not be fed into the reader properly. 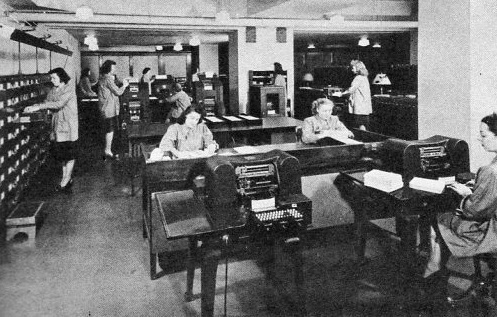 All data-entry was done by punching cards with a stand-alone punch-card-machine with a QWERTY-keyboard. using 52 combinations of 6 bits to code numbers, characters and symbols. 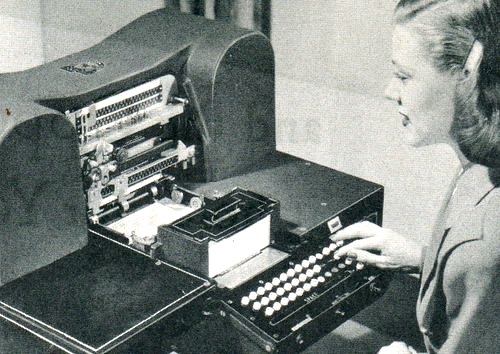 1- Data : 			 with 90 characters of data punched in 6 bit Remington Rand-code (RR). 2- Programs:			 containing one address and one instruction in RR-code. 3- Programs in MC:		 with 8 instructions or numbers in the four bit code. 4- Standard routines:		 provided by Univac, like arithmetic- and card reading-routines. 5- The routine LOAD:		 to load programs. A self-loading program, started by typing in a bootstrap. All instructions and operands existed of a signed word of ten digits, each digit coded biquinary. The name Biquinary did mean that each digit was coded binary, only the fourth bit represented the value 5. This value-5-code made the (hardware) calculation to access the magnetic-drum-memory more simple. Apart from the numbers there were six odd codes, named: k y t K Y T.
These were used to address the three registers or were used in calculations as sentinels. For Alpha-numeric data-entry the 90 column cards were punched in the Remington Rand code (RR), a 6 bit alfa\num.-code. This code was also used for punching programinstructions. 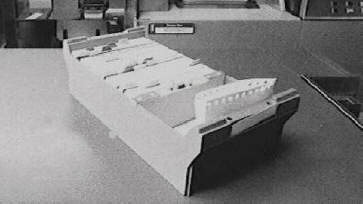 lines of holes in the punched cards,  wich would make the card easy to fold and to got jammed in the high speed cardreader.